Art meets petrolhead in an exciting new show opening at Messums in Wiltshire next week (6–29 May) which celebrates great post-war car design. 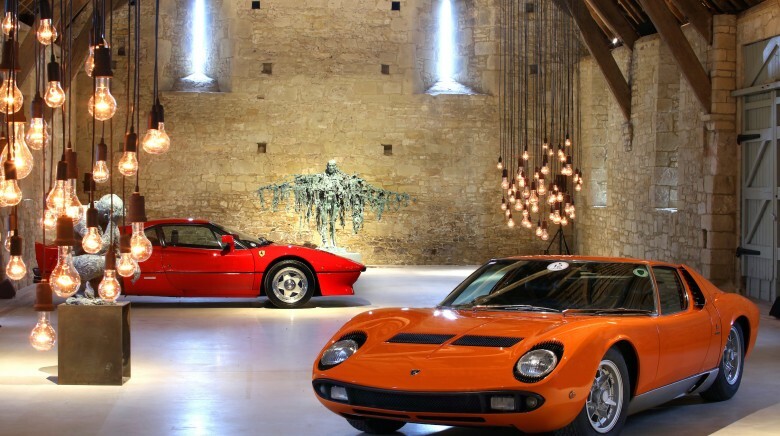 In the gargantuan tithe barn, seven European sports car icons including two ultimate McLarens will be rubbing shoulders with contemporary sculpture pieces. ‘Art in Motion – Knowledge and Design’ is just the sort of show we love, an analysis of invention, inspiration and the creation of beauty which also perfectly shows off the amazing space that is Messums Wiltshire. The seven cars on display include a 1950s/60s Alfa Romeo, a 1960s AC Cobra,a 1960s E-type Jag, a 1960s/70s Lamborghini, a 1970s and a 1980s Ferrari and a McLaren from the 1990s. There will also be two ‘guest’ appearances from the Riversimple Rasa and the McLaren P1 supercar. There are talks throughout the month from invention and design experts such as Professor Dale Harrow, from the Royal College of Art on modern car design and inventor and car manufacturer Hugo Spowers who presents his electric, hydrogen-fuelled Rasa and Mark Roberts from McLaren who discusses the design of supercars. Petrolhead or not, this show is a sure crowd pleaser. The gallery will also be showcasing the works of Angela Palmer which are made from car parts of wood, bronze and crystal. Gallery founder Johnny Messum says: ‘In the pursuit of manufacturing we have become too readily divorced from the very real creative impetus and personality that goes into the making process. This is as true of art as it is of cars. On the one hand we live an an age of reductionalism dicated by the efficiencies of mass production, while on the other hand we are looking to individualism and sparks of genius to make essential leaps and changes.